It was a beautiful fall day, one that felt more like summer. 33 weeks pregnant with my second boy, I was doing my best to get as much done as possible while my oldest napped. This pregnancy had been so different from my first. Leo was such an active baby (a fact that remains true today). Little did I know that this day would be the beginning of a very terrifying chapter in my life. When the bleeding started, I went into shock. I called my husband who told me to call 911 immediately. Surely, my baby was gone. After an ambulance ride and hours without answers, my sweet Leo entered the world at 2:29 AM. At 33 weeks, I was told his lungs wouldn’t be ready for the world so hearing his brief cry was as sweet as hearing his heartbeat for the first time. But it didn’t last. Leo was whisked away to the NICU where he would call home for the next 21 days. I’ll never forget my husband and I sitting alone in the hospital room just minutes after his birth wondering if all this was real. When a nurse finally came in, she tossed me some parts and said “start pumping”. This was the start of my journey through postpartum. I was, without a doubt, in survival mode. I didn’t have a single second to think about what I’d gone through or to begin to process because my babies and my husband needed me. 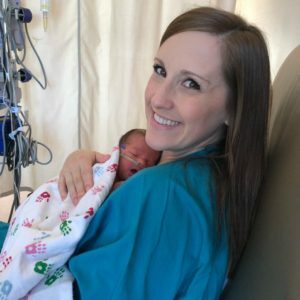 I went through the motions of balancing hospital and home-life like a champ. Family and friends were surprised to see how well I was doing and honestly, I was too. But as soon as Leo’s health improved, I crumbled. I started to experience dark thoughts that terrified me so much that I was afraid to be alone with my kids. Imagine holding this beautiful miracle, who you wanted so badly, and suddenly having violent images of how you might go crazy and harm him. Your worst fears playing out in your mind on a constant loop. Sure, I’d heard of postpartum depression but no one ever told me anything like this could happen! 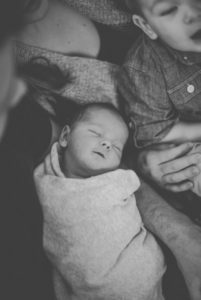 The thoughts became so frequent and the fear so intense that I started to avoid objects that could be potentially dangerous, wouldn’t give my babies baths and, on particularly bad days, would make my husband stay home from work. I was living each moment with a horrible sense of dread that something terrible was about to happen. Soon, I was overwhelmed by feelings of helplessness and shame. I thought that if I told anyone about the scary thoughts I was having that they would surely take my children from me. So, I remained a prisoner in my mind. I would wake up each morning praying that my brain wouldn’t already be playing the horror movie that had become my existence. But it was always still there. The pit in my stomach, the terrifying images, the “what-if’s”…I was in agony and a shell of the me I used to be. These feelings were coupled with intense guilt. Guilt for the extra burden I was putting on my husband, guilt for avoiding my children and guilt for ever having the thoughts at all. My unwanted thoughts started to convince me that I must be some sort of evil monster and that my sons deserved a much better mother. There were many days where the hopelessness I felt was so deep and heavy that it made me question if I would ever get better and even how much longer I could go on this way. But this was the face of Postpartum OCD. Somehow, by the grace of God, I found the courage to ask for help. However, like many moms, I immediately felt defeated by the number of weeks I’d have to wait to get an appointment with either a therapist or a psychiatrist. I desperately started searching Google for a local support group or anything that could help me make it through. I stumbled upon Postpartum Support International’s website and saw where they had a warm line for moms to call. On Friday night, before a holiday weekend, I called and left a message with my contact information. By the next morning, a local PSI rep had already contacted me. She quickly put me in touch with Sarah from Moms Mental Health Initiative, a local group I’d never heard of. Here is where my story begins to change. Within hours of my first conversation with Sarah, I was sitting in a therapist’s office! Not just any therapist but one who was educated on Perinatal Mood and Anxiety Disorders and who was sensitive to the unique symptoms and vulnerability that moms like me can face. The amount of relief I felt after that first appointment is indescribable. Sarah also added me to Circle of Hope, MMHI’s online peer support group. The amazing women I connected with in Circle of Hope openly shared their experiences and offered an outpouring of advice and encouragement. I’d like to end this post with “and she lived happily ever after”. And while that’s true, my days aren’t without struggle. The reality is that recovery from this disease is not linear. Just when you’re basking in the light, a dark day (or few days) slaps you upside the head. But the difference is that I’m no longer walking through the darkness alone. I have a safety net of amazing people, resources and love around me. And some days, just knowing I’m not alone is enough. So, I see you mama. You’re tired, you’re beaten and you are terrified. But stay strong. Keep fighting and know that through this you will learn that you are capable of more than you ever thought possible. That this trial will show you strength you never knew you possessed. What you’re experiencing is real but it is also treatable. If this sounds like you, I hope that by sharing my story you’ve been inspired to ask for help. Or, if you already have, I hope it’s given you the courage to keep going. You will get through this and you will get better. And someday it might be your story that gives another mom hope.